Food Chain / Food & Drink Are you ready to buy McDonald's as artisanal? Any argument about who's had the biggest influence on food in Chicago—Achatz or Trotter? Szathmary or Banchet?—can immediately be shut down once someone makes mention of Ray Kroc. The shake-machine salesman built McDonald's into the epitome of a worldwide fast-food empire. If you think that's a bad thing, it probably is in some ways. But I was in Budapest a year after Communism fell. There were two McDonald's there, and they were filled with locals. Did McDonald's have them hooked on greasy burger-and-fries crack already? Maybe. But it was also because until McDonald's arrived, only tourists with hard currency and Party big shots were able to eat in restaurants. An icon of capitalism brought eating out to ordinary people when 45 years of supposed Socialist rule had not. Now the Oakbrook-based chain is going though some rough times, thanks in part to a new generation that would rather eat at slightly more upscale and natural-seeming chains like Chipotle (which McDonald's owned at one point). A 2014 list of the top 100 fast-casual chains—you've read it, I'm sure—shows lots of aspiring names, few of which you'll have heard of yet. They seem to define themselves in terms of how they're not just a quick, can't-think-of-anything-better-to-do trip through the drive-in at Mickey D's. From number-one-ranked Smashburger ("recognized as one of the first to take on the 'better burger' concept") to the hippie ethos of number four, Freebird World Burritos ("from piercings to tattoos, employees are free to look how they please"), to the no-styrofoam atmosphere of number seven, Modmarket ("Each location has clean, modern designs, uses real plates and silverware and serves food the way it was hundreds of years ago"), the list implies that people want something nicer and more real than the experience offered by the QSR (quick service restaurant) titans like Taco Bell, Subway, and, most iconically of all, the golden arches. Battles like these, and the corporate reshufflings they spawn (McDonald's sent CEO Don Thompson packing in January), may be invisible to most customers, but how the company is responding to them is as visible as the point-of-sale marketing that went up recently in thousands of stores nationwide. If Mickey D's enemies are places that have "fresh" in their names and use words like free-range next to their proteins to communicate "we're real food, not a place with a clown mascot," this campaign aims to say "we're just as real as they are." Of course, McDonald's isn't going to actually acknowledge the existence of these rivals; that would do the burger titan about as much good as bashing pumpkin-peach ale did Budweiser. 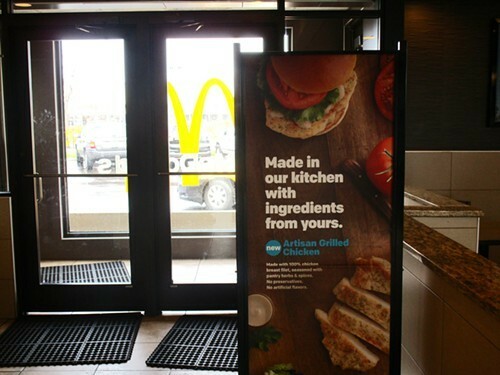 So instead McDonald's is equating itself with the ultimate producer of artisanal goods: you. Yes, you, the person who spends all those hours pickling your own ramps and who buys free-range heritage-breed chicken. McDonald's takes every bit as much care as you do, except faster! It's a dubious claim, but even more than that, it's centered around a fantasy version of how its customers shop and cook. The campaign doesn't reflect reality for millions of McNugget eaters. So McDonald's abandoned the strategy of positioning itself as an occasional break from cooking—because no one actually cooked anymore—only to once again position itself as the alternative to all that cooking you supposedly do. Cooking they do just as well as you do! It seems unlikely to be very effective—it's not particularly convincing to the people who actually do cook like that and may leave the vast majority who don't just scratching their heads—but with a million little fresh markets and world burritos and falafel grills nipping at their heels, Mickey D's needs a break today. A slogan on a bottle of Bud Light backfires. Strange though it may seem, truth can be hard to come by in the advertising game.